Trying to find the best e-commerce platform to start your dream project? You're in the right place! Internet economy or e-commerce changed the whole picture of today's business. We got a new form of interactions between consumers and organizations. If you are going to start your business thinking that it’s easy to make money online, you're at the risk of making a mistake. We aren't discouraging you, it's the reality you should consider to prepare a better plan. Finding the best e-commerce platform is like finding the best car! Obviously, it's in the market, but you need to get it as your own. And the basic facts-features of an e-commerce platform to make it more engaging and user-friendly. This detailed comparison will help you make an honest evaluation of which solution suits the needs of your plan. Let’s start with a short overview and why top brands are increasingly using e-commerce platforms. The first e-commerce transaction was an electronic fund transfer that occurs among banks using a secure private network. In the late 1970s, electronic data interchange (EDI) allowed companies to exchange necessary business documents through the internet. The late 1970s and early 1980s brought the popular electronic mail service that enabled fast and cheap online communication. In the late 1980s and early 1990s, different electronic systems were developed for easy collaboration. Finally, in the 1990s, the World Wide Web enabled smooth and low-cost digital communication. Also, made possible a variety of business exercises for companies of all sizes. E-commerce has three main characters. The journey wasn’t so easy as it seems today. Although it started long before, online shopping became possible only after the internet was opened to the public in 1991. Amazon.com is one of the first e-commerce websites in the US to start selling products online. After that, thousands of businesses including top brands have followed their way. The comfort and freedom, safety, time management, and user experience have made it easy to achieve phenomenal growth for e-commerce. The e-commerce industry has 40 years of long and rich history. It continues to grow with new technologies, innovations, and almost all sorts of businesses entering the online market every day. E-commerce today isn’t only an alternative way of making money; it’s a proven platform for any organization to be considered as priority basis. Why Top Brands Use eCommerce Platforms? Online presence is something any organization can’t ignore. To maintain a real-time connection, to reach a new audience base or simply to keep themselves updated all types of organizations now rely on the online platform. Finally, it’s a demand of time. Anyone could just fall behind if ignores it! 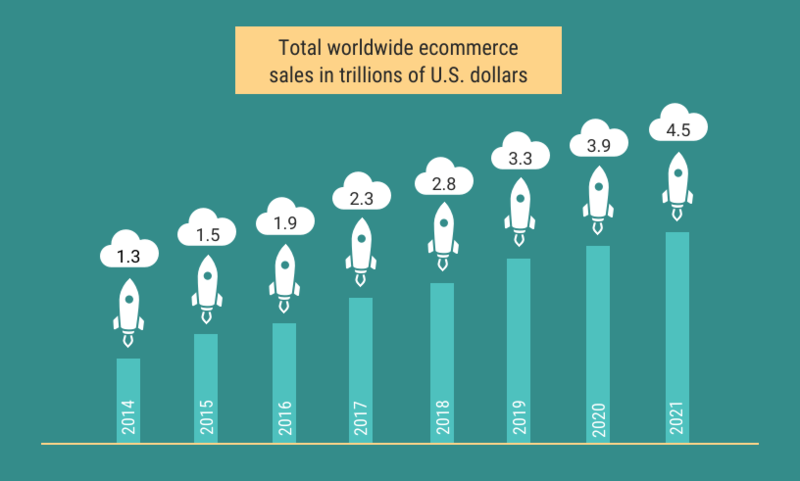 Not only that, it’s estimated that global e-commerce sales will reach $4.058 trillion by 2020. That would surely make e-commerce a growing and profitable industry to be in. 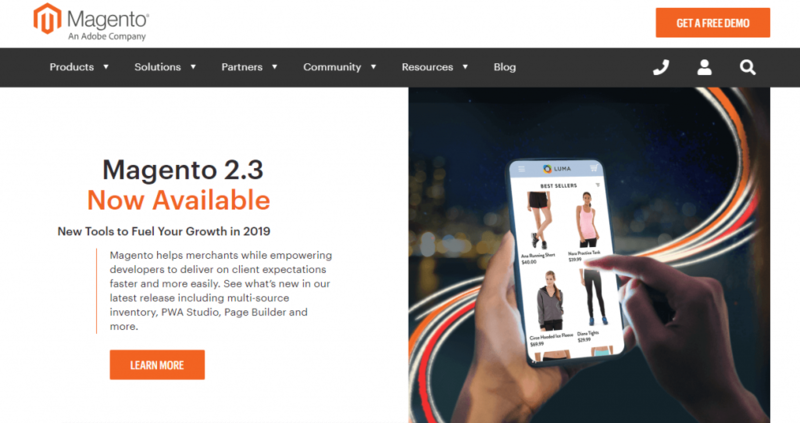 An eCommerce platform is basically a software application that empowers online businesses to run & manage their website, sales, and day to day operations. There are mainly three types of e-commerce solutions in the market. SaaS and Open source based solutions are popular among the businesses. CaaS is a growing trend regarding them. It is too a cloud-based solution like SaaS. We are going to cover the top 8 e-commerce platforms with basic features, pros-cons, and the verdict. You will also get some awesome stores as examples to easily get the whole picture. WooCommerce is a name in the e-commerce industry that needs no introduction. It’s a free WordPress plugin specially designed and developed for e-commerce. Nowadays WooCommerce is the most popular eCommerce platform out there. 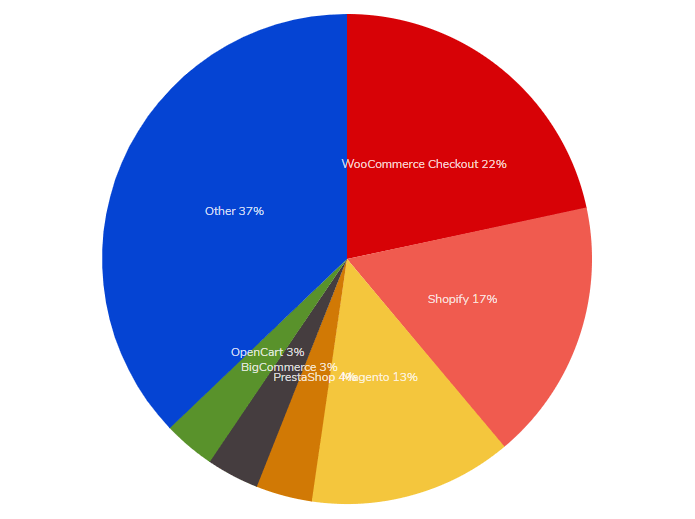 With over 58,217,504 downloads, WooCommerce powers more than 28% of all online stores. Woocommerce comes with lots of handy features such as a secure payment gateway and shopping cart that serve really well. You can turn your WordPress based Woocommerce single store into a multivendor marketplace anytime just adding a free plugin like Dokan. 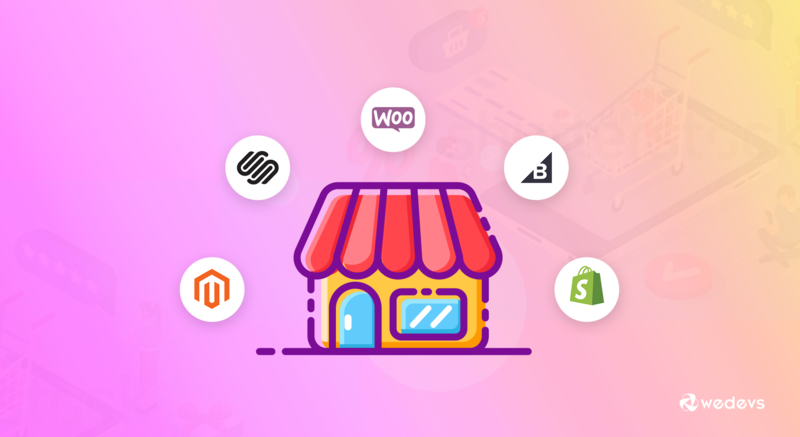 WooCommerce is a flexible e-commerce solution for all sorts of business organizations, especially for startups and mid-level businesses. 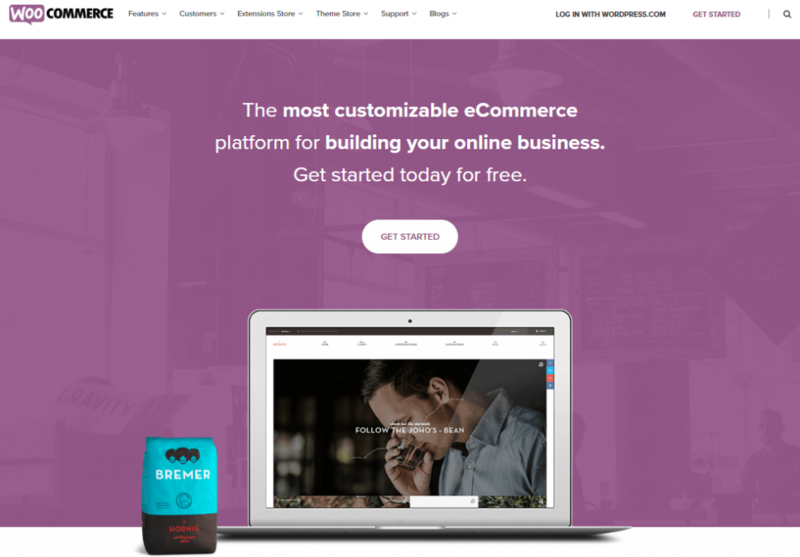 If you want to efficiently meet your success with a minimum budget and in a short period of time, Woocommerce can be the best solution for you. Moreover, you have the option to turn your store into a multi-vendor marketplace any time. Woocommerce is free as a platform, also have unlimited free plugins and themes to customize it. But integrating some unique features to make it more user-friendly and competitive may require additional investment. Lack of scalability and sometimes performance could be an issue, but you can fix them with its excellent community support. Example: Single store- Singer. You can check more single stores built with WooCommerce. Multi-vendor marketplace using Dokan– Bootstrap & MyMuslimMall etc. Shopify is one of the most popular e-commerce solutions in the industry. 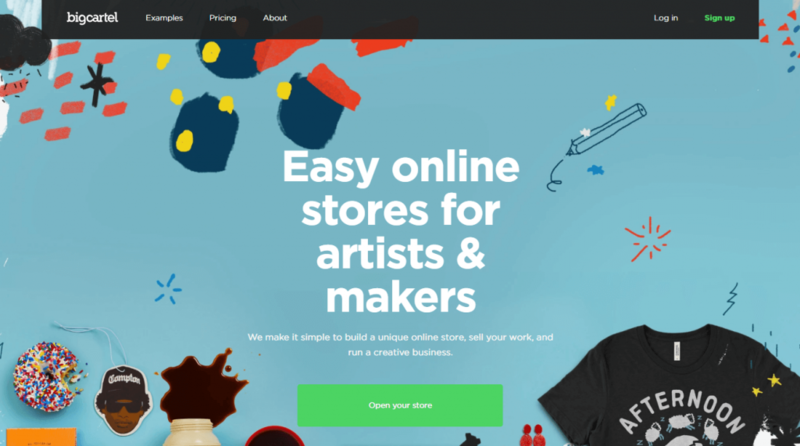 It’s famous with small shops because that is the market Shopify is intending to serve. The secret behind Shopify’s success is the rich app store that makes it simple to extend the capabilities of your default web store. Shopify offers hundreds of apps, more than any other competitor within the market. It also offers a pleasant selection of professional themes. A large community of the store owners like WordPress community in the Shopify forums to exchange tips. 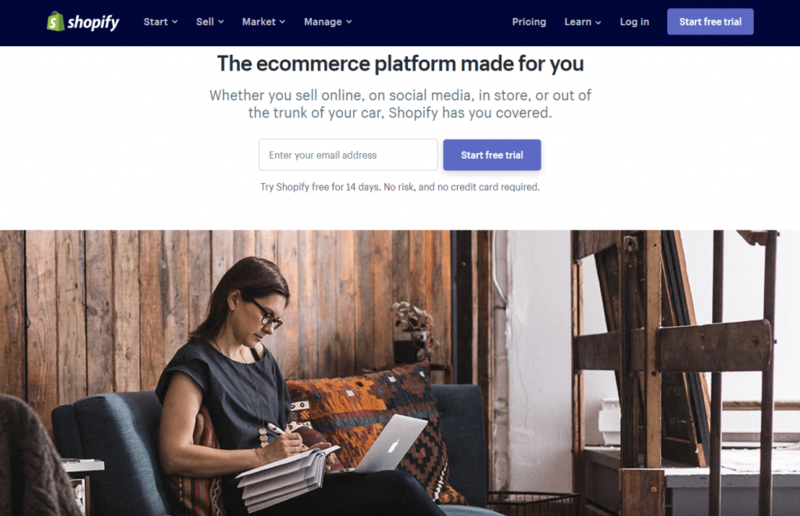 If you are going to run a startup online selling business, Shopify can give you a great start. When you are thinking big, functionality and customization would be a fact with Shopify. Shopify provides a very limited collection of free themes and templates. 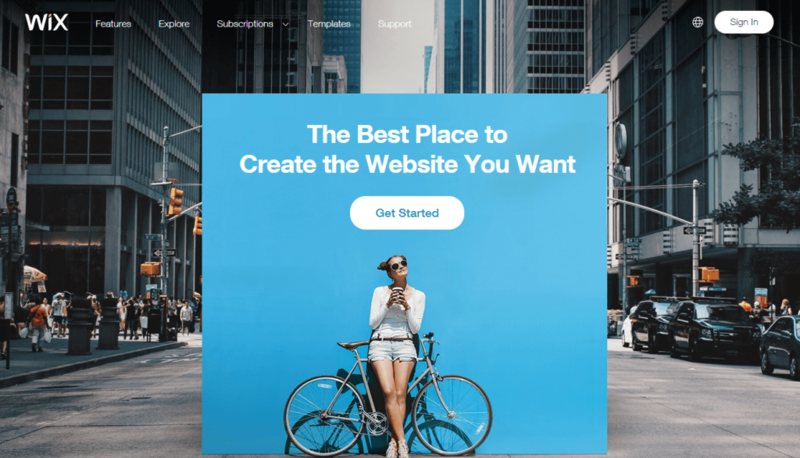 You need to spend money to make your site unique as you like. Moreover, you will have to pay to use its app store. Sometimes, getting real-time support is a challenge with Shopify. So, you have limited options with Shopify and also need to have a good amount of budget that is not very suitable for startups. Magento is also an open source based e-commerce solution with a flexible shopping cart system. It's historically preferred by brands who have already invested in IT or development teams. They have launched a cloud solution in more recent years. The advantages to Magento include 100% control of your own e-commerce marketplace. It’s good for businesses that already doing well. When we talk about features and ease of use, Magento is one of the best solutions out there. But cost, development, and support are the things you need to reconsider with Magento. BigCommerce is one of the best e-commerce solutions with a viable and powerful interface. It has now more than 95000 live sites selling online and dealing with payments. So, there are reasons for keeping faith in their solution. 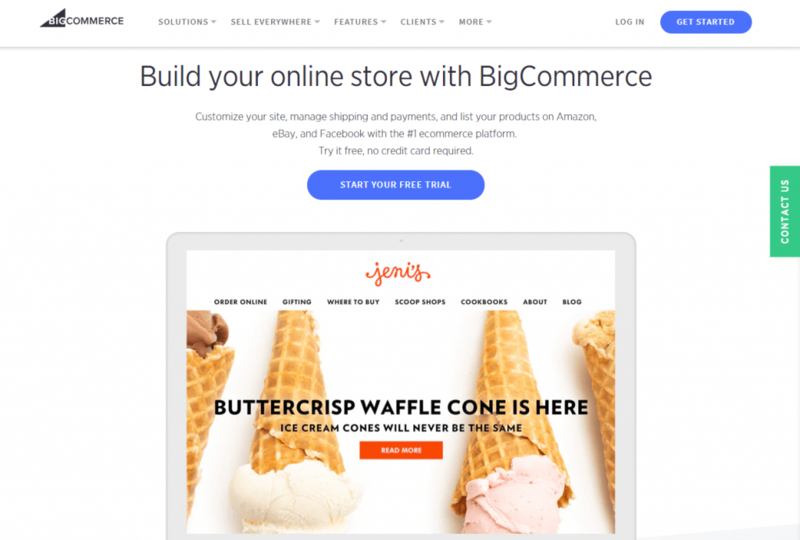 It’s easily understandable that BigCommerce is popular for small- to medium-sized web stores. BigCommerce offers more features to grow your online sales than other shopping cart software within the market. Although the pricing seems comparable to Shopify, BigCommerce feature set is a bit better for each plan. BigCommerce works well with small companies. You can also consider it for your mid-level project. But it’s not so perfect for enterprise-level businesses according to experts’ saying, although it offers a totally different solution. Budget is also a fact with BigCommerce. Try to find out what you need the best and BigCommerce could offer that or not. 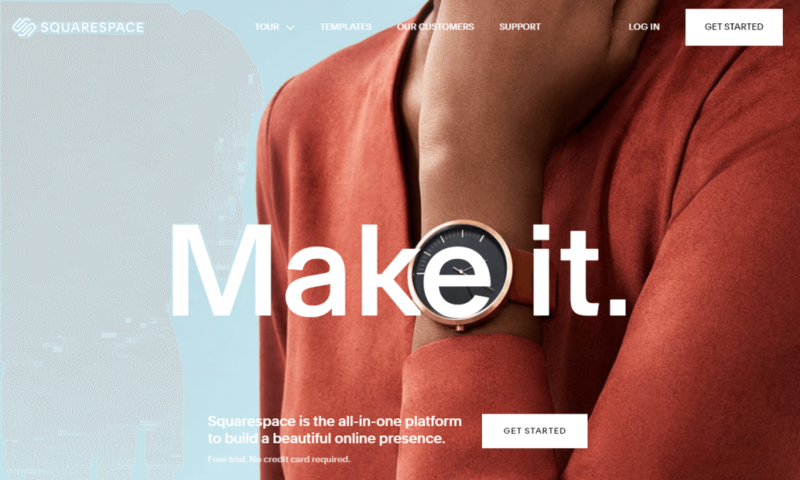 Squarespace is the all in one solution to create beautiful websites. It was launched in 2004 as a basic drag-and-drop website builder. Today Squarespace has over 1 million users, which is a prove to its durability and care to customer satisfaction. Squarespace has a fully loaded e-commerce solution with traditional web building solution. Squarespace is a great platform that is perfect for businesses that want fresh and rich imagery templates. It has a great product listing option. Lite and Pro, both of its plans allow unlimited products, which is a tremendous advantage for retailers of any size. One downside is that Squarespace has limited integrations for payment gateways. Currently, they only offer Stripe integration. And you know Stripe isn’t always available to vendors from smaller countries. Wix is basically a free website builder, gained popularity in a very short period of time. They also offer eCommerce solution as part of its premium packages. Wix eCommerce solution doesn’t surprise with its features, but it has enough to make your shop up and moving. Wix’s excellent visual interface design makes it special. You can easily design and differentiate your shop’s element in any color you want. When you are running a single product store or selling a limited number of products, Wix could be one of the best suits for you. Volusion is a leading hosted eCommerce platform and one of the oldest store builders out there. They focus on providing a complete solution for e-commerce owners who prefer hosted solutions. Volusion has a lot of built-in features that let you easily start, manage and grow your online business. The best thing with Volusion is that you have full control over your store’s functionality and customization. And there is nothing to worry about security and support etc. Pricing is the main fact you should consider when going to choose Volusion. Volusion requires monthly pricing; as well as transaction, credit card and add-on fees etc. These are not so welcoming for startups! Design and customization features are too limited with Volusion. There is no option to add a blog or selling digital products. Volusion is great if you have an online store that has some developer resources, and you want an easy to manage operations features. If you prefer design and customization features, Volusion isn’t so perfect for you. You may consider WooCommerce or Shopify. Big Cartel is a specialized solution for artists, musicians and people who want to sell their creative products/services. It was founded by Matt Wigham in 2005. Matt was looking for an easy solution to promote his band and sell their merchandise. And there was nothing that could serve his purpose, so he built a solution with Eric Turner. Since its inception, over 1.5 million artists have signed up and now use the platform. The people we hire are artists in some way. They play in bands, they are photographers, they make jewelry- we try to represent that community. Being one of the best solutions, Big Cartel caters to a very specific community. It is specially designed for creative persons who want to sell their creative works as their own. Artists without any coding knowledge or web developing experience can easily start a site with Big Cartel. As a small brand, you too choose this solution. But it’s not exactly fit for general marketing goods. These are the top 8 e-commerce platforms out there. We have tried to describe each of them in a way that it should be. Now it's your turn to take an overview, apply your point of view and finally, pick the best one regarding your plan. That's not the end. There are some more facts you should certainly consider before and after choosing the platform. Let's have a look. E-commerce platforms offer businesses the capability to customize product information. The key advantage of the e-commerce solutions is empowering organizations to reach a broader market. These platforms also offer a low-cost channel to gather customer feedback. 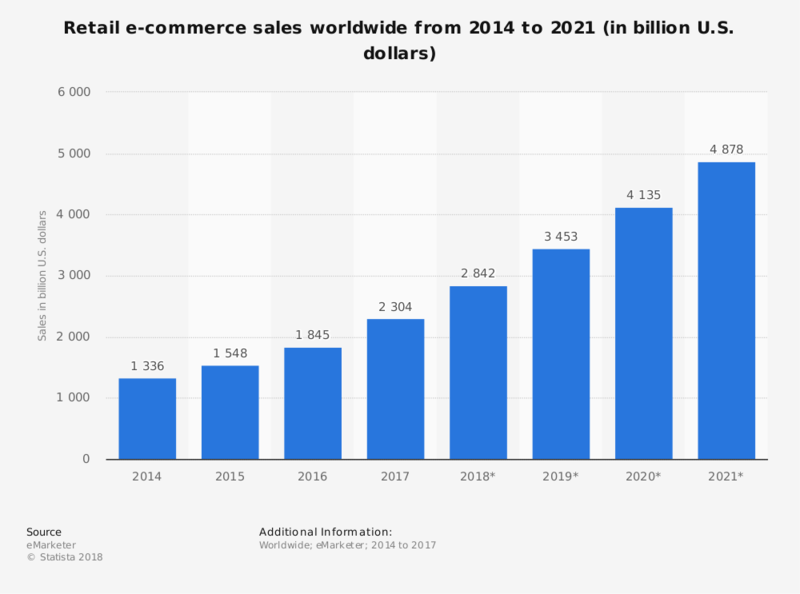 In addition to scalability and security of your data- as we mentioned earlier, e-commerce platforms offer a handful of operational advantages and business tools. The impact on operating costs is varied with different e-commerce service providers. As a survey report by the European Union, some users (vendors) would prefer to sell directly in order to avoid the fees and margin charged by the platform. However, platforms are much cheaper than physical stores in all sense. What Is the Right Time to Start Your E-commerce? How efficiently your idea can solve that particular problem? If there are already some competitors- how they solve? How do you differentiate your offerings regarding them? How easily and cheaply you can provide your service? And finally, how long people are ready to pay to solve that problem? If you satisfied getting the answers from your insight, you are just a step away from your success! Get ready to start! Go ahead with creating a unique e-commerce marketplace of your own. Hundreds and thousands of people are waiting to be your partners-vendors to open a shop on your marketplace. And you know- today success depends on idea and differentiation rather than money or something else. Single vs Multivendor Marketplace: Which One Is Better to Start with? Investing in single-vendor e-commerce is suitable for businesses that already sell offline. Bringing an offline brand online helps increase brand awareness as well as revenue sources. Another instance of the suitability of a non-multi-vendor store is when manufacturers selling their own goods want to make them available for online buyers too. Offering discounts and cheap prices are also not feasible, so attracting more shoppers becomes difficult at times. If you want to target a larger audience than regular eCommerce stores and want a website that attracts millions of visitors, sells more products, earns voluminous profits; multi-vendor marketplace is a simple solution for you. If you want to start a profitable online business but do not like the idea of buying products, updating products catalogs on regular basis; let the vendors do it for you and earn a commission. All you need to do is bring them together to sell through a common platform. Making money with the multi-vendor marketplace is really easy as you can see. 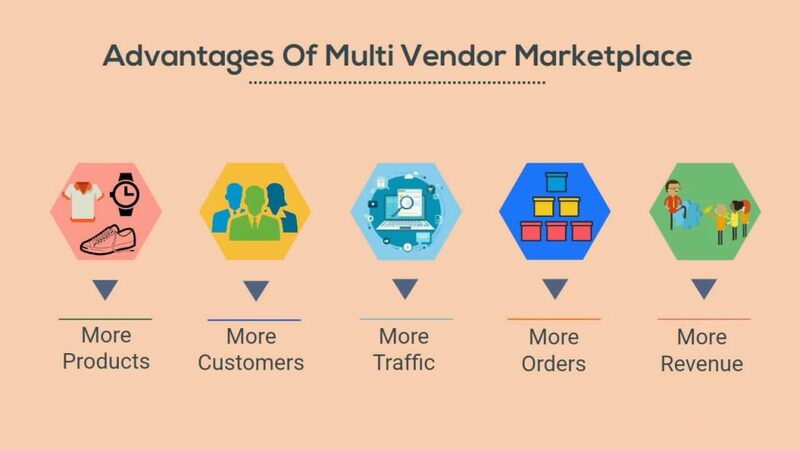 Why a Multi-vendor Marketplace is better? 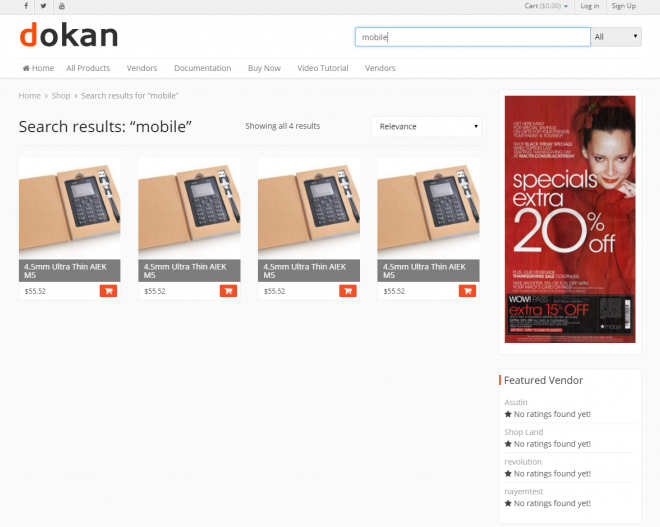 Check the easy way to build and customize your marketplace with Dokan’s free solution. A multi-vendor marketplace needs a lot of features to perform day to day business activities. When you are going to select the platform for your e-commerce, try to ensure these features at a minimum. Third-party vendors need to be able to get easily registered and create their own product dashboard. You could consider another option for your customers to start selling their products by adding themselves as vendors only by a few clicks. The search option is always essential for eCommerce. For multi-vendor marketplaces, it’s a must-needed feature. People today not only come to shop, but they also love to add a comment or review about how they experienced the product. The review is also a smart medium of marketing and generating leads. So make sure that your customers are able to easily review products as well as sellers so that sellers can establish a reputation. You know that e-commerce business has no boundaries. If you select one single payment option, customers from different countries or who has not that particular payment would fail to make a transaction. So try to select a platform that allows you to set up multiple payment options from the first day. Some marketplaces are limited to digital or physical products. You’ll need to pick the option that fits your goals. Platforms that includes both the option you should prefer that. At a level, you may need to add other types of products too. Tax and delivery are two important features you should consider as priority basis. Getting inspired by the product features, people want to check these fields before confirming the order. Some people even check it before than product details. You have started your marketplace to generate revenue by charging a commission. It’s one of the major ways of your income as an owner. Your platform needs to not only allow this but also make it simple to handle payments easily. Charging commission with different patterns is also an important consideration. This is good to inform your customers when their orders have been approved, processed, shipped and/or ready for delivery. It’s a common feature for any e-commerce platform. You have the option to ensure a quantum leap over your competitor by giving your customers a tracking number for their order. There are also some fully customized conversion tracking plugins to help you- like Woocommerce conversion tracking in the WordPress community. Invoice is something that helps you to create and maintain a trustworthy environment in your marketplace. People love to get quick information about what they bought and how much actually they spent to adjust their budget. When you have a marketplace, vendors across the countries would join to sell their products. Sometimes your vendors may need to sell the same products what others are already selling. Here is the product duplicator to help you. When you have selected your platform and started to design your shop, you need to consider following things to make your shop more user-friendly. First, you need to reconsider your perspective to dominate the market. In this competitive era, it’s obvious that you have to think differently. Try to avoid the strategies that your competitors are already applying. Now check these things carefully. Check Your Search Button That Really Works! Customers give priority to online shopping for their lack of time. You know that search button plays a vital role to quickly find a product or easily make a comparison. That’s why you should make sure that your search button really works from the beginning of your action. And keep checking on a regular basis. Did you think how do you want to show your products through the search box? First, make your search box visible, open and easily accessible to your consumers. With Woocommerce and Dokan, you will get it as a built-in solution. So, you don’t need to worry about. You would find the solution with some SaaS provided software too. Otherwise, you need to customize it manually. Your sales depend on how smartly you could present your products. Show your products to the customer and they will show you money! However, consider the fact with proper importance. It’s another significant fact you should consider to make your shop as real as possible. Show lot’s of up-close photos from different angles. Your customer could get a real view and feel to finalize a decision. Your photos work as your salesforce in the e-commerce platform. Try to present all your products in a way that easily attract consumers. Sometimes fancy, 3D images or videos are more productive to serve your purpose. Give more and more focus to differentiate your product presentation. Social media is one of the best fields to increase both of your sales and leads. Make sure that you have successfully added and activated social media integration. Customers today love to buy and share product with their social media accounts if they like. So, you should make sure and always keep an eye on your social share option. People also love to buy favorite products directly from social media getting influenced by their friends or family members. Transparency Always Wins the Hearts! Tax and shipping are the two important facts you should focus mostly. People love to see tax policy and detailed delivery report before starting their shopping. Many people wouldn’t even buy if they don’t see the related information. So provide your details report about delivery and tax and try to keep it in front of the eye of your customers. This would help you turn more visitors into customers. Your sales mainly depend on your site’s appearance on Google ranking. The more people find it, the more you would get sales. There are lots of alternatives within the market. People wouldn’t always try to find you specifically. So try to ensure your marketplace’s ranking on the top. 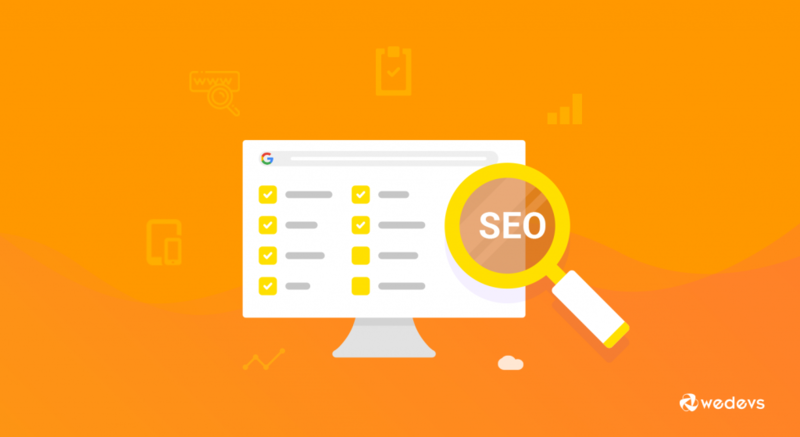 If necessary, invest on your store’s SEO. And you know better SEO means better Google ranking and of course the best possibility to increase your sales. Test, Grow, Evolve and Change! Do everything to reach new people and retain the existing ones. Business is a field you can’t be satisfied at any level of it. Your running growth doesn't make any sense about the future possibility. So, try to focus more on your marketing plans and keep testing, evolving or changing all the existing plans again and again. You would just wonder seeing the result at the end of the day. To grow and shine in e-commerce, there is no scope to make a mistake while choosing your platform. Read the article carefully, you will surely be able to pick up the best e-commerce platform with ease. We explained most of the popular and powerful platforms in this post. Now it’s your turn to make a decision and get a go. When you are done with your platform selection, this post would guide you on how to make it more engaging and user-friendly. And you know this is a never-ending process. So it's also important to choose a vendor who is really committed to providing real-time support. Let us know- which platform is best as your opinion and why?… Wish you a very successful e-commerce journey.